Incredibly lifelike and long lasting, dentures are a removable replacement for missing teeth that are designed to duplicate the look of natural teeth. 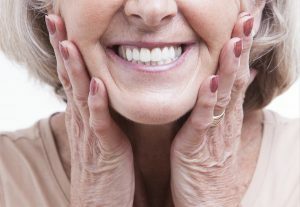 Dentures are not only aesthetically pleasing, they can also improve your oral health and overall sense of well-being, allow you to eat, smile and enjoy life to its fullest. A Complete denture replaces the arch for a full set of upper and/or lower teeth. Dentures consist of acrylic or ceramic teeth and a lifelike gum-colored acrylic base that covers the gums and whole arch. A removable partial denture is a natural-looking replacement that fills in the spaces created by missing teeth. While they serve a cosmetic purpose and make eating easier; they also keep natural teeth from shifting or losing bone levels. A partial denture typically uses clasps that grip the natural teeth. Less noticeable precision attachments are sometimes affixed to crowns on natural teeth. An implant-supported denture can be fixed or removable. First, titanium implants are placed and intergrated into the jawbone. After the healing of 4-6 months is complete, your denture will be fabricated. There are special attachments on implant-supported dentures that snap onto the titanium implants. Candidates for implant-supported dentures must have healthy gums and sufficient bone, though bone augmentation can sometimes be performed before if needed. If you would like to learn more about how Desert Breeze Dental can help you improve your smile and your oral health with dentures in Las Vegas, please contact us at 702-869-0032 today! Our compassionate and experienced dental team looks forward to serving all of your dental care needs.